I told you about the Degree motionSENSE™ and their “Get Into the Move Challenge" a while back. If you'll recall, Degree with motionSENSE™ anti-perspirant & deodorant is the ONLY product that's activated by motion rather than moisture, so it starts working before you start sweating, and that can be significant this time of year and has been helpful to me as I've worked on getting more exercise. I've been enjoying the Degree motionSENSE™ “Get Into the Move Challenge" application. I've found myself doing more things so I can log them and my recent trip to the beach was good for a lot of activity! I've counted simple things such as walking from the parking garage at work to my office rather than taking the shuttle and cleaning up the yard, as well as more structured activities like walking or swimming laps. I'm working on finding something more structured that I will stick with and I can do year-round. I might have to fire up the Couch to 5K program again, but we'll see. 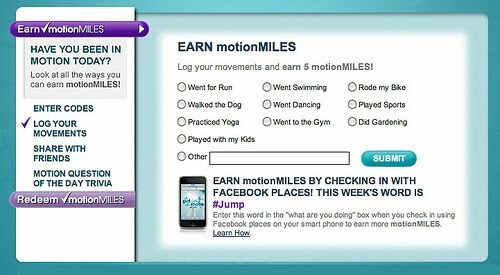 Whatever gets you in motion counts, and you can redeem your motionMILES earned for instant prizes, weekly prizes, and a grand prize. Prizes include a surfing trip in Hawaii, designer shoes, gift certificates for Zumba classes and much more. You can also choose to donate motionMILES in a dollar amount to one of two charities: The Challenged Athletes Foundation and Girls in The Game. 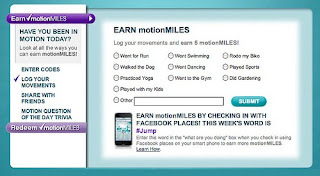 It's easy to the Get Into the Move Challenge, just register for the Degree Get into the Move Facebook app or on mobile devices (m.degreewomen.com), and start earning motionMILES, virtual currency redeemable towards chances to win thousands of prizes. a) Leave a comment telling us a simple way you get more movement into your day. A simple way to get more movement is to park further away than you need to whenever you go to a grocery store or shopping mall. Also I take the stairs instead of the elevator. i take the stairs at work! do it has a family, I used to do my workout during their naptime.. figured out they make my workout a bit fun, so we all do our stretches and step exercises together. Unless it's pouring, I always park near the back of the parking lot at work. Adds a few extra minutes of walking each day. If I'm sitting and watching TV, I make myself do crunches or jumping jacks during every commercial break. I take short walks during the day at work. I usually go for a 3 mile walk with our dog everyday. I walk in the morning before week ~ I find if I wait I have too many excuses. My job is very physical, but I can make it more active (and safer) by bringing the horses in from the fields individually rather than in pairs. And my chiropractor is for ever after me to make more trips with less water in the buckets, rather than staggering along with 2 five-gallon buckets-full. Walking = good; carrying too much weight = bad. Just hard to comply when I'm in a hurry. But I try! Hubby and I walk at least 3 times a week (weather permitting). He is my motivator. I walk my 175lb dog! Keeping up with my grandchildren is a fun way for me to stay active. I always get movement when I run for the bus in the morning. That's the extent of my exercise. Not looking for the closest parking spot. I always try to take the stairs where ever I go. At work I never use the elevator. I get more movement in my day by just keeping up with my little girl and our new puppy. A simple way is to get out of the house more often and walk around our neighborhood. To get more movement in my day, I park a little farther away from the entrance when I go to a store. If I have time, I will make a trip around the full perimeter of the store at a good pace. I move by walking everywhere I can. I lead an active lifestyle by following my two kids around. People do get the fact that being a single parent is hard work and really is exercise. We go on family walks and hikes periodically. I go on walks almost daily and work out at Curves. I go for walks after dinner with my son. I walk a few miles every morning. My goal is lose weigh. We go to the gym as a family :) It's much more fun and I don't feel guilty about not spending time with the kids. I go for a walk every morning - even if it's just around the neighborhood. It always gets me refreshed and ready for the day ahead. recently diagnosed with diabetes so I have to get this weight and eating under control!! I park as far away as I can when I go to the store, I take the stairs vs. the elevators. I also walk to my co-workers office if I have a question vs beeping them through the phone system. I park a ways away from any store I'm going to and walk to the post office every afternoon instead of taking the car. I work out first thing in the morning so that I have more energy and motivation to keep moving throughout the day! I try to find new ways every day to move more. I get more movement into my day by doing a lot of gardening and taking walks. I get more movement by bike riding. After dinner my daughter and I have been doing some bike riding. I’m running a 5K in October and training for it! I have a little exercise walking type machine on the back patio right near the doors. I hop on and do a few minutes whenever I pass by that part of the house. Just a few minutes at a time adds up! Also stretches while waiting for something in the oven, etc - 2 or 3 minutes at a time - again it adds up! I shared on Twitter: http://twitter.com/#!/AsTheNight/status/97758060042391553. I take my cat out for walks or play with him. The gym as often as I can schedule. Walk the old dog when he can take the ehat or the cold.Keep moving at work. Try not to stay in one place too long. My dog helps me to keep on moving. I have to walk hiim twice a day. Mmm. Not sure if this is a "simple" way to get more movement, but I just bought a townhouse style condo. I enter in the basement, go up to the main floor, and the bedroom is on the second floor. Yay for increased movement! When I shop or run errands, I always park at the end of the row in a spot farthest away from the door. I recently discovered these 10 minute exercise options that are part of my cable tv service. Ten minutes can slip right into a busy schedule. Yoga is a very relaxing way to help you stay in great shape. Dogs make good motivators--they need to be walked! I always walk to the store for any last minute items I need. I only use the upstairs bathroom, adding stair steps to my day. I take the stairs when I can and park a little further out to get more walking in. I also started taking advantage of a water aerobics class on my lunch hour that is available at the university I work at. I get extra movement by walking around the house twice or 3 times whenever I am working! I'm definitely going to try this deoderant! I am a 41 year old working mother of three who gets up at 5 a.m. every weekday morning while my family is still fast asleep to get in a seven mile run before work. I get more movement in the summer by watching outside sports. I go and watch softball, which makes me end up moving more than I would if I were sitting inside all winter. TalkIng to me about exercise is bad. I am an exercisahlic. I dance, walk, do videos, take and teach classes, hr 4 x a wk in the gym. I told you don’t ask me. But that is just me. A simple way to get more movement is to have a garden. Planting, watering, harvesting keeps you on the move. We have started playing lots of tennis as a family. Thanks for the chance to win! By WALKING to the mailbox! I get more movement by walking the kids to swim team practice instead of driving. I get more movement by parking further away from the office. If I park in the next town, I can make it to work in time to turn around and walk back. I am a runner, and I have a half marathon coming up soon...better get on it! I get more movement by walking everywhere I can - be it the store, the library, the park, etc. It may sound silly....but I get extra movement by doing lunges and squats while cleaning house! My family bike rides daily or rollerblades. We take a walk every evening after dinner. It's not only healthy but very enjoyable. Chasing my giggling child around the house when I realize they took the last Dove dark chocolate piece! I don't move myself, but Goldie drags me around for a few miles every day. I've been treading water while I let my daughter do 400 jumps off the diving board with the big kids. 30 minutes of treading water is a great workout way to add a few minutes of movement! An easy way to get more movement, is to get a 'standing desk' for when you're working on the computer. Also take the stairs when possible. park far away from your destination so you'll have to walk more. little things add up! My way to get more movement is to not "be lazy". I will think things like "I would like some water but I don't feel like moving" - no more! I am trying to be more energetic about things and I do think it makes a difference. The way I get more movement in each day is to only carry one thing at a time... lots of trips back and forth in the house. We also have a 5 acre lot and a dog that like to "wander". A simple way I get more movement into my day is to take the stairs instead of the elevator or escalator everywhere I go, to park in the furthest spot in any parking lot, and use my coffee breaks at work to get a few more steps in. Thanks! I exercise in the AM and make it a priority. I run all the time. This is how to stay fit. It's been really hot this summer, so I try to walk early in the morning. When I go to the mall, I walk the entire way around, even if I just need to go to one store. Due to an injured knee and shoulder, I am focusing on PT and stretching to get me back moving period! LOL I can’t wait to be able to walk, bike, and hike again! I park as far away as possible. I use the stairs instead of the elevator. Once you get in the habit, it's not so bad. One way I get more movement is to park in the back of the parking area when I go shopping. I get a few exra steps in there that way. I try to go for a quick walk every day, it makes a difference. We walk together as a fam. By myself, I don't stay with it, but together we last longer! I park further away from doors when I am out shopping. I also started walking with coworkers inside our factory during lunch hour. Workout buddies help a lot in keeping the commitment. I find I walk longer distances when I have a purpose. So I walk whenever I have an errand within an hour walk from home. Luckily I have a couple drug stores, a grocery store, a couple dollar stores, a library, and more within that range so I can get in my walk almost every day. To get more movement I take my dog for longer walks, park far away at shopping center and run holding onto the cart. Sadly, it's the only running I can do! I always park far away at work and I take the long way to the time clock, that way I am getting extra steps into my day. Sounds silly, but the simplest way for me to get moving is to change before I leave work so I pretty much have to head to the gym or the running path. I play with my toddler which is a ton of exercise! He’s so active that he forces me up and off the couch! I've recently decided to get a bicycle to start riding it to work...I'll save on gas and get daily exercise. i like to get moving my walking my dog. We have a pool in our condo complex which we visit almost nightly for exercise! I subscribed to audible.com and I love listening to books! I have a book that I can only listen to while I'm up and active. This makes being in motion so much easier! I find excuses to do something so that I can listen and I'm looking forward to school starting so that I can do even more while the kids are in school with my headphones on! I walk during my breaks at work and walk/jog with my dog every evening. One simple way I get more movement in my day is to go on a bike ride with my children. We have a blast talking the whole time and it's a great way to exercise without feeling like I am. A simply way I get more movement in my day is having my 3 kids. I am always running around with them and running up the stairs cleaning and doing chores. Keeps me very busy and always on the move. A way I get more movement in my day is by going up and down stairs in our three story house many, many times each day. I get more movement by taking the stairs. I also walk the halls at work during my breaks. Take the stairs, volunteer to do the coffee run, walk to stores in your neighborhood. When shopping, I park the car far away from the store entrance, so I have to walk. I walk whenever I can. I live in a smaller town, so most everything is within walking distance. By playing with my kids! I rearranged the spare bedroom to accommodate my treadmill with a view of the TV. I wait to watch my recorded TV programs until I'm walking on the treadmill. When I get involved in my favorite programs the chore of exercising seems somewhat diminished. We garden, which is a workout! It doesn't seem like it, but after a few hours all of my muscles are sore.